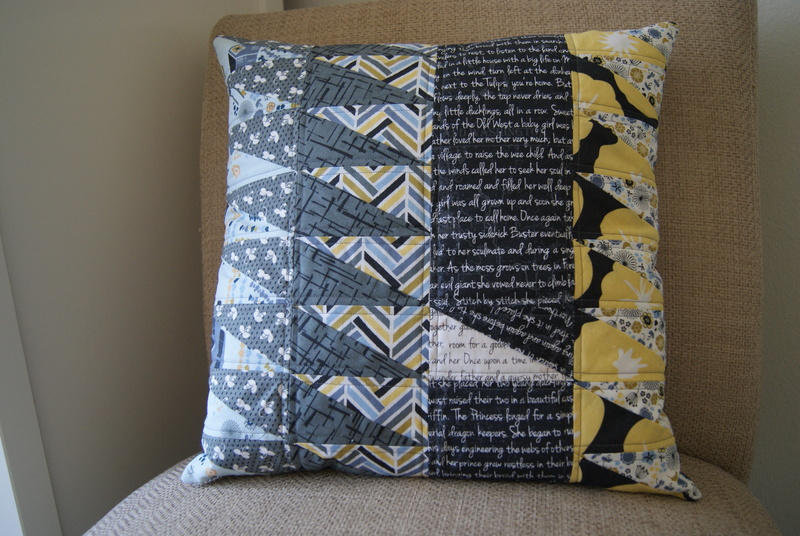 Against my better judgment, I joined the Seacost Modern Quilt Guild’s Madrona Road Pillow Challenge back in December. They cut up the fabric, the blue-gray-yellow colorway of Violet Craft’s Madrona Road for Michael Miller, packaged it up, and asked me if I wanted some. Um. Yes? We decided as a guild that we would make pillow covers for our challenge. (You will see around the internet that other guilds have chosen to go all full-quilt on this one. I’m glad this was only a pillow!) I waffled and procrastinated. I thought about adding the pinks and oranges from Madrona Road, as, really, my heart is with pinks and oranges. But I’m glad I didn’t! I added only the grey Sprout print and the white Memoir print, from my stash. I wanted to do a design with some harder edges to contrast all the sweet, lovely florals in this line. Don’t get me wrong, I love florals. But with the grays and the blues, I thought it was fun to give this some…teeth. 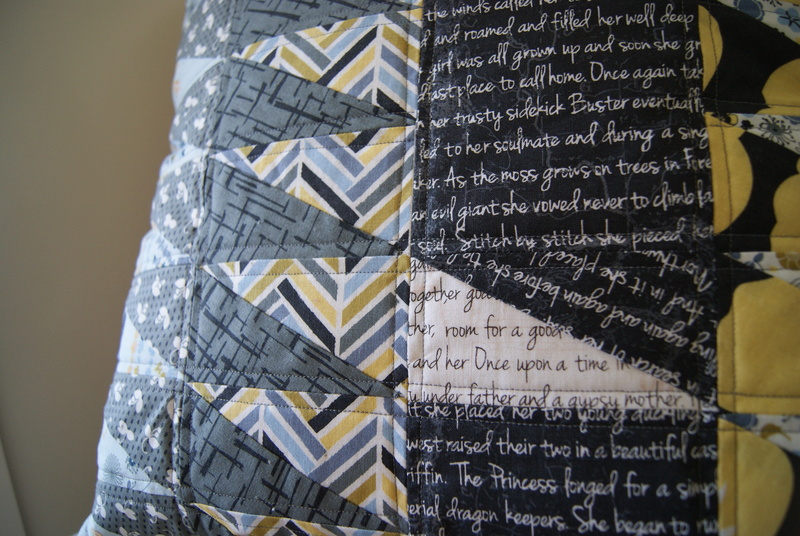 I’ve posted about Badskirt Amy’s Bargain Basement paper piecing pattern, and the blocks I started for the Value Added QAL. I’ve added 15 more blocks to the first four, but have a long way to go. I needed some…motivation. I needed a finished project to remind me how fun the blocks look in the end. So I pulled out some templates, paper-pieced some triangles, and laid them out end to end instead of in interlocking crosses like in Amy’s pattern. If you’re interested, she’s shared her pattern here. 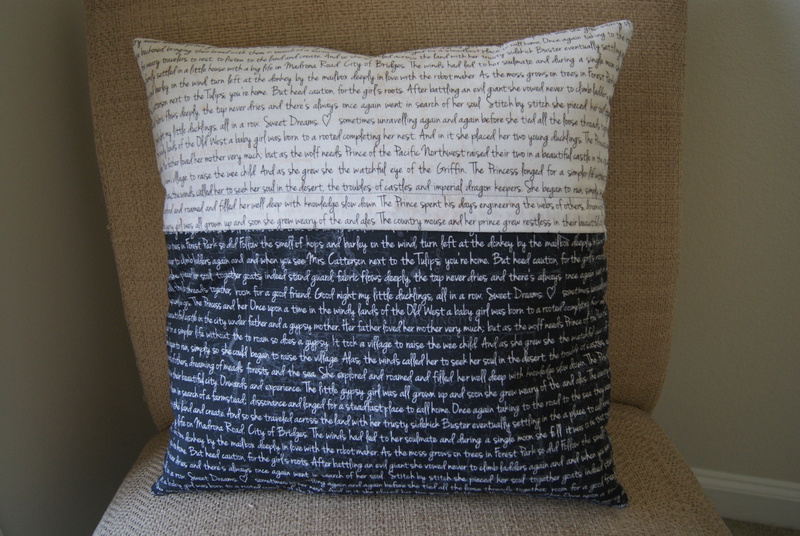 And, because I always feel like my pillow covers are so sloppy, I used Svetlana at s.o.t.a.k. handmade’s excellent tutorial for installing a zipper in a pillow cover. 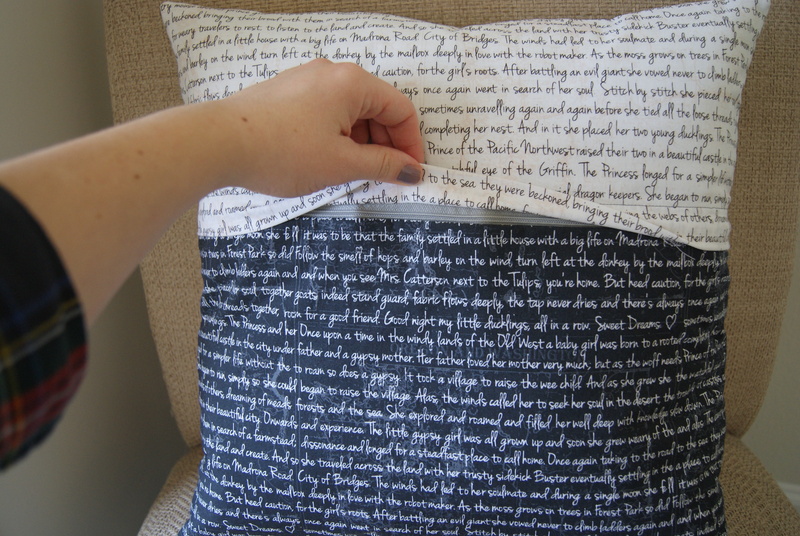 I’m never ever going to do an envelope closure for a throw pillow again. Her tutorial was clear, and easy, and uses less fabric than an envelope closure. I never thought I’d say this, but I had fun putting in the zipper! It’s small, but it’s a finish, and my first finish of 2013. Yay! Very nice. I like the sawtooth look with these fabrics. Nice job on the zipper too. I never have a big enough zipper lying around to try it out. Wow! This looks very cool. I love your pillow very cute and modern looking.